I know I’ve gone on and on before about my love for horseradish and when I found this recipe, I knew I would HAVE to make it. As I suspected, it’s delish. It’s not too horseradishy but you definitely know it’s in there. I used bacon bits so the bacon-hater wouldn’t have a fit (and I used very few). 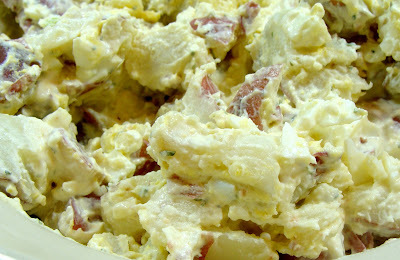 I think that this makes much more than 8 to 10 servings so it would be great for a potluck or a barbeque. N is for New Poatoes! A few weeks ago my Sister in Law gave me a small bottle of olive oil containing chillis and garlic. It has become one of my favourite ingrediants. 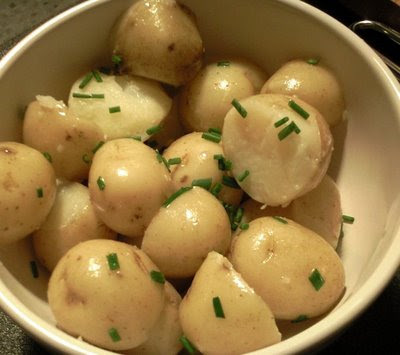 To make a very simple dish to accompany left over meat or chicken, or to go with a quiche just cook the new potatoes and stir in herbs or vegetables of your choice. The one above I added chopped chives but it is equally lovely with chopped spring onions, red onions or dried tomatoes! It is such a refreshing change from the conventional potato saald made with mayonaise. Supposidly we are approaching the warmer part of the year so instead of the root mashes/roast potatoes to go with a roast I will use this together with other vegetables, all in the same dish - so easy to prepare - I just steam all the vegetables, place in a large serving dish and add the olive oil! As I write this I must admit I am feeling inspired to experiment with a variety of herbs/spices to add to the olive oil! Hmmmm next week is O, sorted then O is for Olive Oil! - so come back to see what I am getting up to in the kitchen, all part of my Recipe a week challenge!! I use a lot of minced beef in my recipes and one new recipe I have tried is this one! Jon isn't particularly fond of tomatao sauce so I often leave it out and add an onion gravy! Grease a 1 kg/2 lb loaf tin. 1. Mix the mince, onion, parsley, breadcrumbs, egg, red wine and seasoning togetherform into balls. 3. Heat the oil in a saucepan and cook the onion and garlic until soft. 4. Blend the tomatoes in a liquidiser and add to the onion mixture with the stock, parsley and seasoning to taste. 5. Bring the sauce to the boil, reduce the heat.and simmer for 10 - 15 minutes, stirring occasionally, until the sauce has thickened. 6. 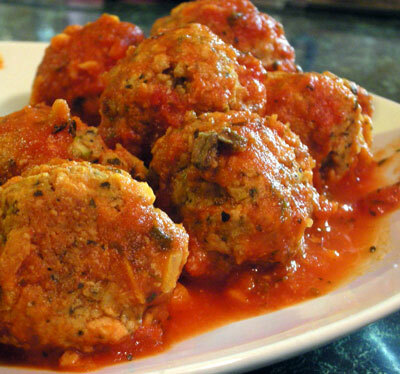 Tip the meat balls and arrange on a serving dish, then pour over the hot tomato sauce. Garnish with sliced pickled cucumber, if liked. We love lamb and for Easter Saturday we sat down to this beautiful joint! I rubbed olive oil, garlic and rosemary into the surface and cooked for a couple of hours. Awesome! We have had leftovers and another meal from this so all in all a good idea of the time!